An American Bulldog smoking a cigar is on the cover of Joni B. Cole’s fifth book, ANOTHER BAD DOG BOOK – Tales of Life, Love and Neurotic Human Behavior, and lucky me, I got to review it. It’s a compilation of 28 essays, and even before I read one of them, I fell in love with this book. With that cover, how can I resist? I think we’ve established that I’m a dog fanatic! Joni is the author of the acclaimed book for writers and teachers, TOXIC FEEDBACK – Helping Writers Survive and Thrive. She also created the three-volume THIS DAY SERIES, including WATER COOLER DIARIES – Women across America Share Their Day at Work. In those books, she observed other women’s lives, but this time, she shifts the attention to her life. So buckle up honey, it’s going to be quite a ride. ANOTHER BAD DOG BOOK takes Joni into the humor memoir writing arena of authors like Jen Lancaster and Laurie Notaro, also affectionately known as the “laugh until you pee your pants” or “laugh until whatever you’re drinking shoots out of your nose” writers. You need to know that Joni is one smart cookie. She has the unique talent for taking low moments in one’s life and turning them into high comedy, or at least making you chuckle. To quote Joni, "perfecting the art of learned helplessness." She has her Masters from Dartmouth College and her book features a 2011 Pushcart Prize-nominated essay called, Strangers on a Train. Throughout the essays in ANOTHER BAD DOG BOOK, Joni is able to find the rich texture of unremarkable days and turn them into something interesting. For instance, she captures an extremely personal, tender moment with her father at a nursing home in the essay "Rest Home," but then turns the story when it risks getting too sentimental: "I was jealous of dad’s lap of luxury known as 'the Garden Spot.' When the Respiratory Therapist came to give my father a treatment, I asked him if I could have a breathing treatment, too, but he acted like I was kidding. I thought about getting a breathing treatment, much like getting a hit at one of those trendy oxygen bars." Some of Joni’s essay topics explore the special challenges of mothering a 'tween; whether or not she’s Vermont-y enough to fit into the Vermont Landscape; how she’s always going to be a little girl to her mom; discovering the secret of "The Secret;" and one of my favorites, is she emotionally well-adjusted enough to walk the labyrinth? These and many more topics are served up in ANOTHER BAD DOG BOOK. Reading Joni’s essays is like having a gossip session with a close girlfriend. You’re dishing about what’s going on in your neighborhood or family. Overall, some of the essays are funnier than others, but when they hit, it’s huge. Joni lives in Vermont with her husband, two daughters, cat and one (slightly) bad dog that inspired this book. She is the co-founder of the Writer’s Center in White River Junction, Vermont and she’s a frequent Speaker and Instructor at Writing Conferences across the country. 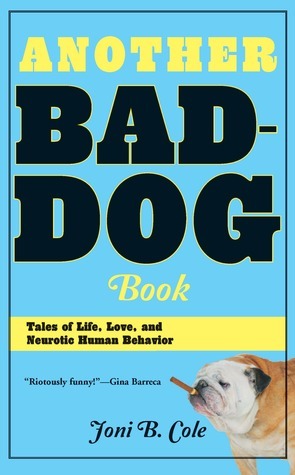 ANOTHER BAD DOG BOOK comes out September 13th. I’m sure by the time you finish reading Joni’s book you will come to know her and her family (and dog) well. You can also enter to win an autographed copy of this book right here at CLC! Joni has three up for grabs for some lucky readers in the US. Just tell us about a bad thing an animal did (yours or someone else's). Did they tear apart your brand new couch? Leave a mess on your floor that should have gone in a litter box instead? Bury your keys in the backyard? Please include your e-mail address or another way to contact you. US only. Giveaway ends August 29th at midnight EST. Reviewer Cindy Roesel nailed my exact intention, to get readers to laugh until whatever they were drinking shot out of their noses! Ha. Thanks for this warm and wonderful review. Now, if only we can figure out why a bulldog is on the cover of a book inspired by a Chihuahua! What a great review and might I add, very well-written! I also love the bulldog with the cigar...reminds me of Winston Churchill! I luv how Jen Lancaster brings awesome humor to not so funny things, just like Jone does when she is with her father in the nursing home. I wish I had this knack. Hence I love reading books where the author has this ability. Still to this day (a 12 year old dog) my mom's dog (my sister lol) Shaina will rip apart & chew into pieces a mouth guard. Once Jason left his out on the night table in the room we sleep in when we visit. Before we left, while we were packing, Jason couldn't find it anywhere. Sure enough my mom found bits of pieces in an area where Shaina hangs out a lot. My DIL's cat chooses to go to the bathroom next to the litter box even when it is just cleaned. My husband wasn't real careful with where he lay his dentures when he imbibed heavily. One morning he woke to find Bubby wearing his smile...dentures as chew toy! Love these "bad pet" stories. Bring 'em on. Of course there is really no such thing as a bad pet, only bad behavior. Ha. When I was younger and I had a dog. He always used to chew up my slippers. I finally got a pair of slippers I didn't like all that much. Apparently, the dog didn't like them that much either because that pair he left alone. Love the review and the bulldog! fab review again Cindy - sounds like one I'll definitely enjoy! My little sister got a chihuahua puppy for Christmas last year and even though she only had him for half a year, (someone stole him) he still mananged to drive my parents crazy. They couldn't get him to use his pads for doing his business. I think he got it right about half the time. One night he got sick from something and when everyone got home, the living room was covered in things it shouldn't have been covered in! Really gross but at the same time, hilarious. I miss that little dog! My rottiweiler used to love to chew up tissues, socks, and water bottles. When I was really young she got into my Christmas presents and chewed them up and ruined them. I still love her though! When we had company at the house, my cat decided this was not acceptable and peed on my laptop bag for work. Luckily, the laptop wasn't in it, but I sprayed it with urine be good and turned it back in at the end of the school year. Bad kitty! Our cat did not like a messy litterbox. At all! Once when we were out of town we asked a friend to come in to check on water, food and the dreaded litterbox which was kept in the laundry room, away from the food and water. He did all but the latter. When we came home kitty was NOT happy. There was food; there was water... it must be the litterbox. Hubby went to the laundry room with our dirty clothes from the trip and let out a horrible yell!! Kitty had pulled out ALL of Hubby's underware from the dirty clothes that had been dumped in the laundry room prior to our trip and were awaiting their turn in the washer. He had buried them in the litterbox... that had NOT been emptied for a few days! What Hubby walked in to see was his underware peeking out from several mounds of letter and hanging over the edges of the box! when 'molly' visits me...she is so kind to leave me a present or two or three...however, i usually don't find them until the next day. I had the sweetest/baddest best dog ever when I was in college. Her name was Kayley Rae. She was a mixed-breed 55 lb of off-white fur. She ate EVERYTHING in sight when she was a puppy including the kitchen chairs, the rugs, tree bark off landscaping, the handles off my brother's bowling ball bag, and last but not least....the tax bill for my mom's car! Ever try explaining that with a straight face at the county clerk's office?! Even though she was SOOOO bad, I loved that dog with all my heart and soul. She was my first dog that was all mine. It just about killed me when she died...I don't think I had ever cried and hurt that badly before (at that time) I miss Kayley even today. She was the best bad turned good dog there ever was!